At the WWDC event this year, Apple had revealed AR as the biggest feature on the upcoming iPhone 8. The Cupertino giant has presented the iOS developers with the ARKit that is Apple’s platform for developers to build Augmented Reality (AR) apps. There is also a dedicated ARKit blog that keeps us posted about the new apps build with ARKit and how cool it is. Many of the AR apps are on the launchpad and shall debut with the public launch of iOS 11. It also means that even older iPhones would be getting their hands on the new AR apps, but we are not sure if their hardware could match up to the requirements. 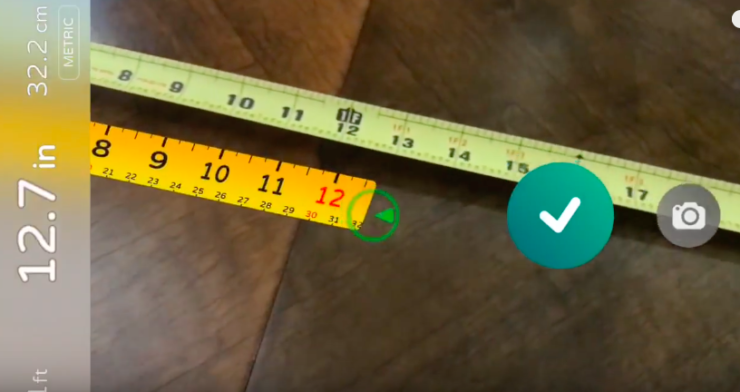 In the two new videos posted on Twitter, developers have showcased a nifty “Measuring” app for an iPhone, which works like a measuring tape or scale to get perfect measurements of an object. With this app on your iPhone, you will no longer need a measuring tape, just open the app anywhere and get the right measurements. The first video (see above) of the measuring app shows a user tapping on two locations to get the measurement from one point to another point. It shows floating numbers to give information about the measurement numbers. On the other hand, the second video is a more near to life demo of a measuring tape, wherein a user pulls the tape from one point and stops it on another point to calculate the inches. The second app is developed by Laan Labs, and they have many videos on AR apps that they have built for iOS with the help of ARKit. One of their videos also includes 3D drawing. Not only Laan Labs, but there are also many other creators on the ARKit, and their apps are amazing as well. One such app that we came across on the ARKit blog is Apple ARKit + Unity + Overwatch Widowmaker Test Recording by Cody Brown (watch the video above). Making perfect use of AR technology, the app creates a 3D figurine at any location pointed by you. Admittedly, we found it pretty scary too. Another app in the list is the Minecraft AR app built by developer Matthew Hallberg with the help of ARKit and Unity. This app enables players to place Minecraft blocks around real surroundings and then destroy those slabs with Minecraft’s crafting and destruction mechanics. In addition to gaming and 3D figurines, Ikea has also partnered with ARKit to come up with its own AR app. We expect the app to let customers try Ikea’s products in their living space, virtually, before making the purchase. Well, these were just the handful of apps that we have come across on ARKit, you can check the complete list of apps demo videos by clicking here. Going by the demo video of these apps, we just can’t wait for them to go public.